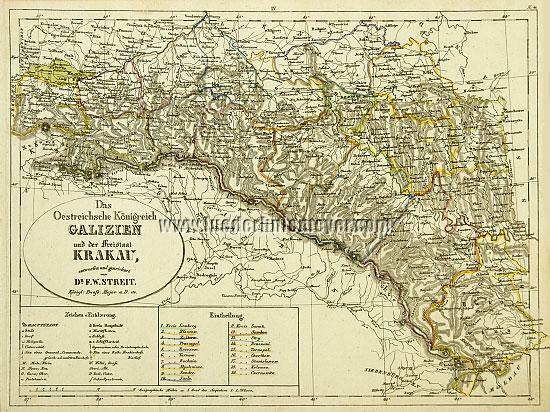 Galicia and the Free State Krakow, The Austrian Kingdom of. With title cartouche, comprehensive signs and symbols, miles indicator + table for the marks of the 19 counties. Map by Friedrich Wilhelm Streit (Ronneburg, Thuringia, 1772 – Berlin 1839) in steel engraving colored in outline. (1837.) 9 × 12⅛ in (23 × 30.7 cm). – In the north still with Sandomierz. – With northern tip of Transylvania. – With the postal routes.